Here are my fish tacos: I paid about $7.00 for the lunch entree. The one thing I learned about fish tacos on my vacation was that everyone makes them differently. These tacos were made with grilled fish and cabbage. I really like the flavor of the spices in these fish tacos in comparison to some other fish tacos I had at another restaurant later in the week. The interior of the cafe was small and quaint, and we all had a chuckle at the waiters who were dressed in beachwear (shorts/tanks tops) despite the fact that it was FREEZING outside. How could they not be cold? The pick below is of my daughter and son-in-law. 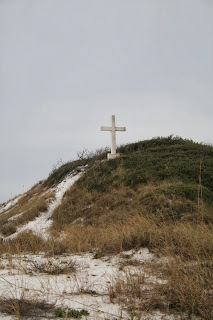 When researching about the Pensacola area, I kept coming across images of a cross in the sand, so I made it my mission to find this cross for myself. It was easily spotted on the way to Fort Pikens for it's right on the main road. It a ten foot tall concrete cross put in place by Catholic Missionaries in celebration of the first Catholic mass on the island. Because it was New Years Eve day, everything was closing early. So after lunch we did a little shopping at the gift shops around the restaurant, and then we headed back to the hotel to get some time on the beach before the sun set. One of our favorite things to do everyday was feed the birds. They are so use to tourists that if you simply hold a french fry or piece of bread in your hand, they swoop down and take it right out of your hand. We love birds and have no fear of them whatsoever, so we really enjoyed have hundreds of birds flocking around us. They would come so close to me and just hover or glide above my head in the wind. I could look in their eyes, and see all the different personalities they had. It was such a magical experience and I got some really fabulous photos. After the sun set, we went back to our hotel to relax before the first fireworks show. There actually was a HUGE event in downtown Pensacola called The Pelican Drop, where they had a lot of shows and New Years Eve activities from 5:00 pm. to midnight, but we were so cold and couldn't bear the idea of spending five hours outside, so we passed on that. We did however go to the Boardwalk Pier at 8:00 pm. to watch the fireworks. I never saw fireworks on New Years Eve before, so this was quite a treat! After the fireworks, we were cold and hungry so we decided to check out a restaurant across the street. This restaurant is up on stilts and is located right on the water. When we walked inside, we fell in love with the atmosphere. It's a sports bar, so there were lots of t.v.s on with all the New Year's Eve games for my hubby to watch. That made him happy! I loved the warm fireplace and the decor. It's hard to describe, but the decor was a beachy/sports type that looked haphazardly thrown together yet somehow worked. It was very interesting and the place made me feel at home and comfortable. 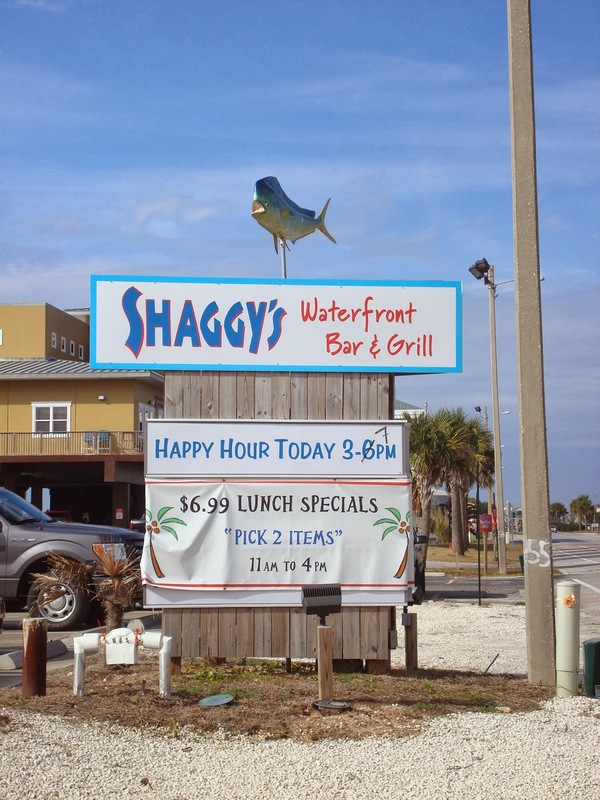 Shaggy's ended up being our favorite restaurant in Pensacola Beach. It was the only restaurant we went to more than once. The prices were very reasonable. I had a crabby patty (my first one of those too) which was absolutely delicious. It basically was crab meat made into a patty and served on a bun. Below are pics of my family inside the restaurant so you can get an idea of how the place was decorated. I loved all the string lights hanging all over the place. One thing we noticed about a lot of the restaurants in the area was that they weren't built for cold weather. Most of them, like this one, were literally open areas that had roofs, but minimal walls. The windows are only covered with a thick plastic that they lower if the temperatures drops. The only heating are fire places/pits or outdoor patio heaters. Some places, like this one, have overhead heaters that blow out hot air strategically over tables to help keep guests warm. Because the restaurants are all open, it is not unusual to see birds inside the establishment. It is quite a fun experience, and quite different for someone who is from a cold climate. When we were done eating we walked back to our hotel. 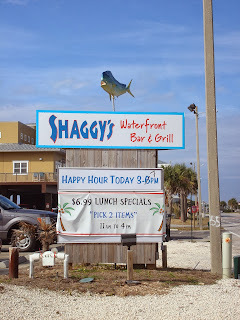 We passed many bars/restaurants that had big parties going on for New Years Eve and had awesome live bands playing. We enjoyed the music as we walked by, but we didn't go into any of those establishments because we are not drinkers. Once back at our hotel we just relaxed in our room as we waited for the second fireworks display to begin. But my husband's and mine over-fifties bodies couldn't stay awake, and we fell fast asleep. But the thunderous boom of the fireworks over the Gulf Pier woke us up at midnight, so we jumped out of bed and watched the fireworks from our balcony. Many other hotel guests were on their balconies too, and we all ooh'd and ahh'd together and screamed 'HAPPY NEW YEAR!!!!!" It was such a magical and beautiful experience. 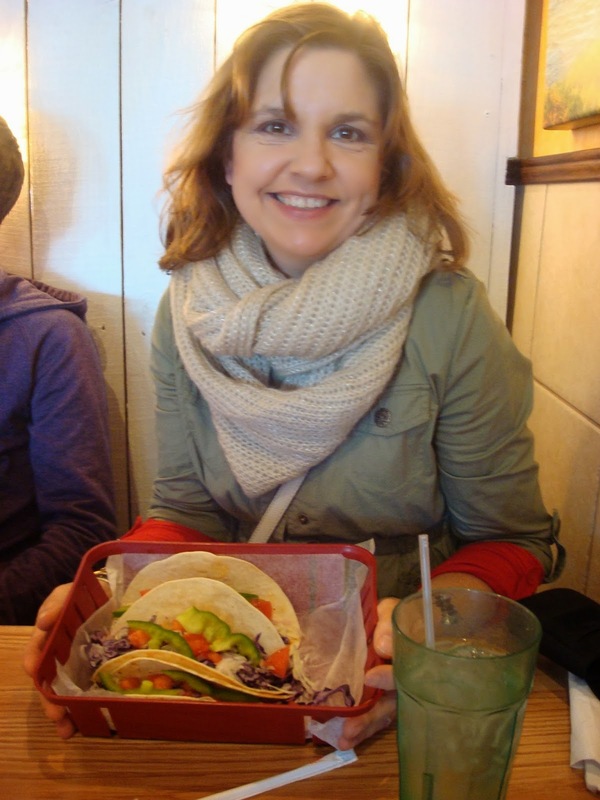 Yummy looking tacos! :) Such fun photos! Thanks for sharing! Wonderful photo's an interesting post! Sounds like a great way to spend New Years!